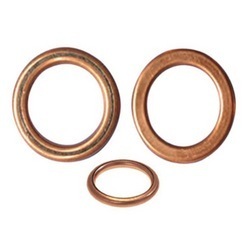 Our product range includes a wide range of copper asbestos rings. Copper Asbestos Rings filled with asbestos can be manufactured as per the requirements of the customer. Also these rings can be filled with and/or Graphite depending upon the requirements of the customer. Looking for Copper Asbestos Rings ?